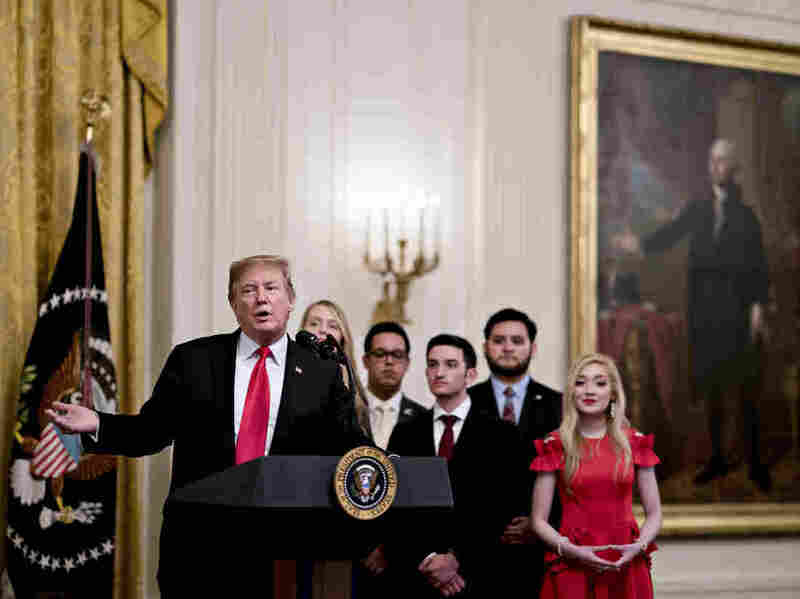 Trump Tackles College Free Speech; New York City School Struggles With Diversity Also in this week's roundup: the White House outlined its proposals on the Higher Education Act, and only 7 black students were admitted into one of New York's most selective high schools. President Donald Trump speaks during an executive order signing on Thursday. Trump signed an executive order requiring colleges to certify that they accept free and open inquiry in order to get federal grants. The order called for, among other things, an expansion to the federal College Scorecard, which reports average earnings and debt for graduates at institutions around the country. But the part that received the most attention was a directive to colleges and universities on free speech. The order gives the federal government the right to withhold federal research grants from schools that block free speech. "If a college or university doesn't allow you to speak, we will not give them money. It's very simple," President Trump said on Thursday before signing the order. Public universities already have to comply with the First Amendment, which guarantees free speech. Private universities, particularly religious institutions, are allowed some restrictions on speech allowed on campus. In recent years, campus free speech has become a political flash point. There have been riots and states of emergency after right-wing provocateurs and self-declared white nationalists have come to colleges to make speeches. Hundreds of liberal professors have also been harassed and targeted by groups like Turning Point USA. On signing the statement, President Trump assailed that "professors and power structures" keep students from "challenging rigid far-left ideology." In response, organizations specifically dedicated to campus free speech cautioned the importance of preserving the issue as nonpartisan. "For continued progress to be possible, we must have a vanguard to defend speech that's above partisanship," Sarah Ruger, a director at the Charles Koch Institute, said in a statement. "We are concerned that wrongly framing censorship as an ideological issue works against efforts to foster open intellectual environments on campus." FIRE, the Foundation for Individual Rights in Education, said it "will watch closely to see if today's action furthers the meaningful, lasting policy changes that FIRE has secured over two decades — or results in unintended consequences that threaten free expression and academic freedom." On Monday, the White House released its priorities in reauthorizing the Higher Education Act, which lawmakers want to update later this year. The recommendations include, among other things, that lawmakers expand federal aid to cover apprenticeships and certification programs, apply lending caps for some borrowers, and require institutions to provide financial aid counseling. The recommendations were outlined in a five-page memo by the White House. Two House lawmakers introduced a bill Monday that would let students pay or repay college tuition using a portion of their future earnings. The bill's sponsor, Rep. Mark Green, R-Tenn., said in a statement that in the wake of the recent college admissions scandal, "now more than ever we need policy solutions that would open up the college admissions process to deserving children from struggling families." On accountability, Rep. Vicente Gonzalez, D-Tx., who co-sponsored the bill, said: "The bill would ensure colleges and universities are doing their part to put graduating students on the pathway to a good paying job." 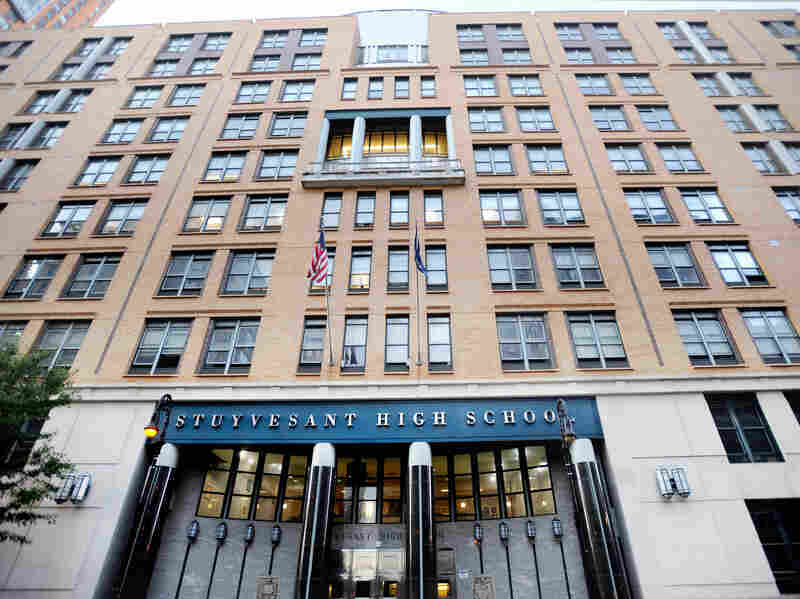 On Monday, Stuyvesant High School offered admission to 895 freshmen — and only 7 of them were black. Stuyvesant is one of the city's eight specialized high schools that require an entrance exam. Some students spend months or even years preparing for it, reports Eliza Shapiro of The New York Times. Last June, Mayor Bill de Blasio proposed phasing out the admissions exam, calling it "a roadblock to justice, progress, and academic excellence" in a Chalkbeat op-ed. He introduced a plan that would guarantee spots in the schools to the top 7 percent of middle schoolers, based on a combination of course grades and standardized test scores. The proposal, as Chalkbeat reported, was met with backlash from parents, some of whom argued that not all accepted students would be prepared for the schools' rigorous curricula. This week, de Blasio said that the recent admissions stats "are even more proof that dramatic reform is necessary to open the doors of opportunity at specialized high schools."